Air Asia Promos 2019 to 2020: AirAsia Zero Fare 2015! 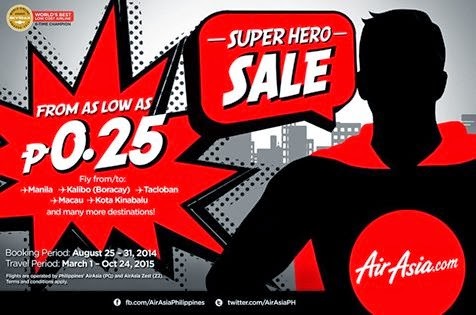 AirAsia Zero Fare 2015- AirAsiaPhilippines SUPER HERO SALE is finally here! Book your P0.25 seats at http://bit.ly/1tkAuED! Manila, Cebu, Boracay, Puerto Princesa, Macau, Kota Kinabalu and many more destinations, all from base fare P0.25 only! Book online at http://bit.ly/1tkAuED or via mobile by downloading the AirAsia Mobile App. Pay online using your credit/debit cards or cash via our payment partners: 7-Eleven, Bayad Center, Cebuana Lhuillier, Robinsons Department Store and ECPAY. Go and plan your 2015 holidays with us! ‘Share’ with your family and friends now!